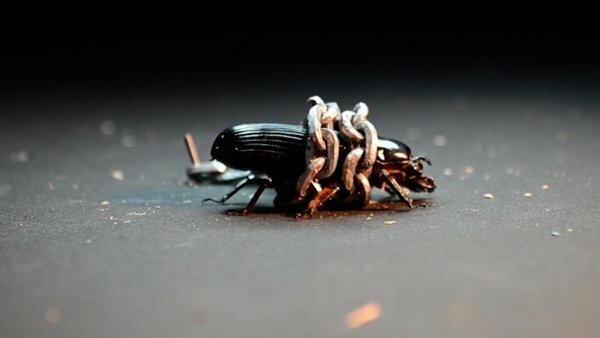 Bess beetle, hand made lead chain and stereo microscope. Joshua Zerangue, born 1988 in Louisiana, is a multimedia artist living and working in Philadelphia, PA. In 2011 he received his BFA in Drawing at the University of South Carolina and he received his MFA at the University of Pennsylvania in 2014. To the right, the screen flashes the translated words of Mallarme's Sonnet: ‘Pour votre chère morte, son ami…’ (a sonnet written for his friend who's wife has passed). In this particular sonnet Mallarme describes his friend's grief and the wife's death as a "double tomb". The video is set up to mimic this closeness of grief and death. The bess beetle (a stand in for the wife) embodies her grief in the present, while the texts serves as the epitaph. The end result is a compressed time space of grief, empathy, and the romantic framework of how people cope with loss.